Due to a big ice/sleet storm which deposited ½ inch of ice in some locations and more than two inches of sleet at our house, only our son, David, his girlfriend, Ashley, and Javid came to join us for Christmas dinner. (The power was out in many locations, making us feel kind of smug as we just tossed another log on the fire and enjoyed our Christmas tree lights.) I ran into a slight snag when I went to set the table, however. 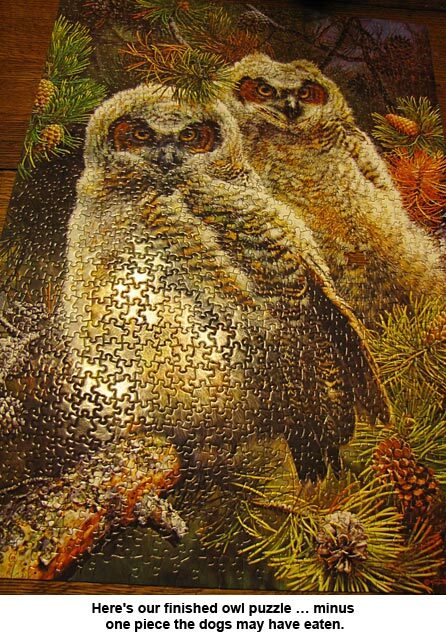 We still had our owl puzzle on the table and, with it being so large, we couldn’t move it without breaking it up. I solved the problem by covering it up with a holiday tablecloth and a lace over-cloth. It looked great and you’d never know there was a puzzle under it. It took half an hour the next day to chip the sleet off the windshield of our Subaru, after the defrosters had run for 15 minutes. Wow, that was a lot of ice! Thanks to all of you for your Christmas wishes, cards, and wonderful letters. We enjoyed every single one of them! Our 20-year-old wheelbarrow, which has seen a lot of use, finally had a handle break off. I suggested buying another handle, but ever-handy Will said he’d just make one from a piece of ash. He had cut several lengths for handles of various tools and had one already in the storage building. 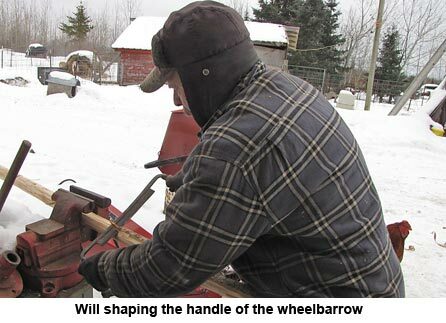 So, taking the drawknife out, he quickly fashioned a replacement handle. In less than an hour, he had the old handle removed and the new one in place. Believe me, it’s a whole lot easier to haul in firewood with two handles rather than one! Our biggest Christmas gift was not one that comes in a box. Our mother wild turkey showed up on Christmas Eve! Now she’s back in the yard with the other turkeys. One of her “kids”, a tom, showed up the same day, but must have decided Mom was nuts to come to civilization. I surprised him in the storage building when I was getting goat feed and he flapped and flew way up on a beam. That was the last I saw of him, but he may be back. After all, he found out where the grain is stored. A very happy new year to you, Will and all your family, Jackie! Thanks for the news on the happenings at your slice of paradise! Happy to hear that momma turkey is back! Thank you for your consistent presentation of information throughout the years, with the wonderful pictures and explanations of how you and Will accomplish whatever task abruptly shows up in front of you. What a team! Jackie, you have taken on more than many people do in a lifetime, and at times alone. To have raised children–adopted as well as born to you, relocated numerous times, dealt with cancer, death of spouse, caring for parents at your home, building a homestead from scratch, and then to have chosen to share your life again by marrying Will–wow! Many of us have perhaps done some of the life challenges listed above but seven or more??? And yet you are able to keep up with writing, and a blog…sprinkled with humor too. Will and you together are nearly unstoppable with the combined talents you share. Its my wish for you for 2017 to continue making your home comfy and one you will be able to enjoy for many years to come. For now, having more helping hands on the property will be an added bonus! First time I’ve read your blog, really enjoyed it.. thank you for it. I just ordered some backwoods year anthologies, can’t wait to get them. Happy New Year to you. I would really enjoy and appreciate some articles about Will, and where he got his amazing skill set. Or articles by Will. No matter what needs fixing or inventing he knows what to do – he’s like a walking FoxFire book. I know what a draw knife is, but have no idea how to use one or how to shape a piece of wood to look like another piece of wood, wouldn’t have a clue where to start. Don’t know how to weld or fix tractors. Sigh. Will has made such a difference to the success of your homestead. Happy New Year Jackie and Will! Peace, health and blessings on you and yours! 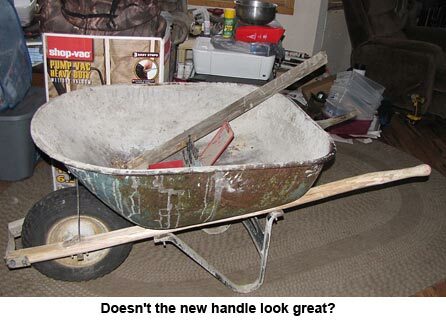 I’ll bet the new wheelbarrow handle lasts longer than the original one! Hope you have a Happy New Year – and better weather!